Our RSVP Advanced page is the easiest way for you to keep track of your guests. As well as any other arrangements to do with your day. Who is coming to your wedding? Who is accompanying them? Who unfortunately can’t make the date? Who you still need to chase for an answer? Only provides the email address or phone number for guests to contact you to RSVP. 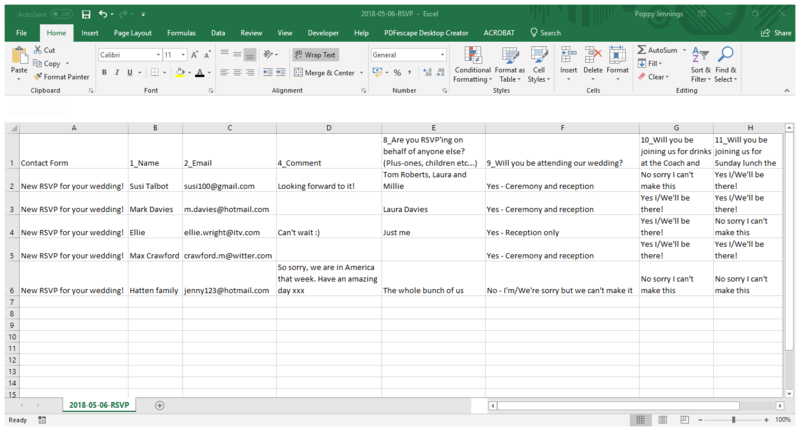 You must then put it into a spreadsheet yourself, making sure everything is kept up to date as the big day approaches. Within seconds of your guests sending their RSVP, all the information is automatically collated and updated and available for you to view. You are alerted by email every time there is a new response or a change to a previous RSVP. You can immediately see, from your up to date spreadsheet if there is anyone you need to chase up. Another feature of the RSVP Advanced page is that it will automatically collate responses to other events around your wedding. For example, an evening in a pub the night before, or a post-wedding lunch, where you need to know the number of guests in order to make table reservations etc. We will set up the form with all the necessary questions as well as anything else you want to ask your guests ahead of your big day. Your RSVP form can easily be modified if necessary and remember, we are always here to help you! Are you RSVP'ing on behalf of anyone else? Will you be joining us for drinks at the Coach and Horses from 7pm on Fri 17th? Yes I'll be there! Will you be joining us for Sunday lunch the London Apprentice at 3pm on Sun 19th? Yes I/We'll be there!